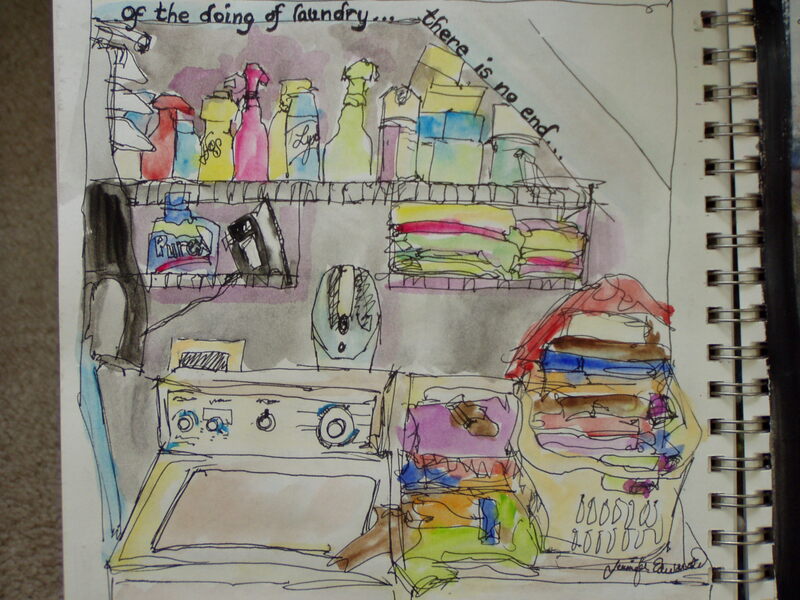 y-to-day life of laundry, household upkeep, shuttle-bussing kids, helping with homework, and the bazillion and one other things that we do on a day-to-day basis that hardly get any notice, much less make it on our “to-do” lists. Danny Gregory taught me that ALL of life is drawable and worthy of looking at closely enough to really “see” it and thereby celebrate it! His books are filled with drawings of the inside of his pantry, medicine cabinet, quick sketches of his child as he grows, of his wife and the day-to-day beauties that are actually there even if tragedy has entered your life. I now own not only Creative License, but Everyday Matters AND his most recent An Illustrated Life which is a compilation of many illustrated journalers like himself, but who have vastly different approaches and drawing skill-levels. I have ALWAYS loved my sketchbooks. I even secretly thought that my sketches were usually better than the paintings that ensued from them. I used to think,though, that the REAL art was what was produced FROM the sketches. Now I know the real art is in the sketchbooks. This is true of how I feel about other artists’ work as well. Open any art book on ANY artist and I will pour over the sketches and drawings that are usually put in the margins and reduced in size. They are the real thing! The sketches and drawings are a record of the artist’s thoughts, first-blush encounter with his/her subject matter, the “play-around-with-ideas” phase, etc. You must, must read any or all of Danny Gregory’s books! Visit his website that I have listed in the Blogroll section…his website has been newly redesigned and is a feast of inspiration. Grab a cup of coffee, sit down with either book or site. But be sure to have your sketchbook and pen ready…you’ll be drawing before you finish any of them.